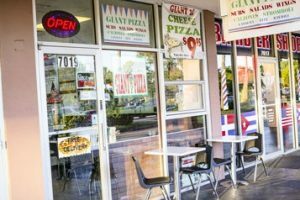 ***** Giant Pizza, 7019 Taft Street, Hollywood, Florida 33024, (954) 963-2273. Going anywhere special this year for Mother’s Day? Jeff Eats, Mrs. Jeff Eats, Daughter Jeff Eats and Son Eats and something like 40 other people are doing Mother’s Day 2017 at our friends Richie & Lynn’s Hollywood home- food by Giant Pizza! Absolutely delicious…that’s assuming you’re into thin/crisp crust, just right- sweet sauce, the perfect amount of mozzarella cheese and enough pepperoni to choke a freaking horse! Got a real good pizza joint for you guys…Giant Pizza in Hollywood. Yesterday, Jeff Eats and Mrs. Jeff Eats’ friends Richie and Lynn- had something like 30 people over to their Hollywood-house to watch- some Sunday football!- the food served came from Giant Pizza in Hollywood! Just so you know, Giant Pizza is basically a “takeout” but does have a couple of tables inside/and a couple outside if you insist on eating there. The food ordered included…philly cheesesteak/meatball parmigiana/chicken parmigiana/sausage & peppers parmigiana/tuna salad subs- chef/antipasto salads- NY Style cheese/Sicilian pizzas- garlic rolls, boneless breaded buffalo wings, zeppoles, cannolis and I gotta tell you, I really enjoyed Giant Pizza’s food! I’m also thinking, that everyone else- also liked the food because they were like Mahatma Gandhi- breaking a fast! Now for sure, free is always good- but Jeff Eats and Mrs. Jeff Eats did contribute a cheap bottle of red wine and a large Publix fruit-platter to the mix- so it wasn’t exactly a free-outing! To their credit, everybody – brought something- cakes, wine, booze, beer, pastries…and a real-real good time was had by all! 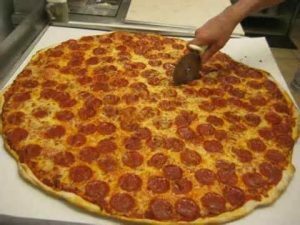 Like I said, I enjoyed Giant Pizza’s stuff- with its 30″ New York Style cheese pepperoni pizza being -a really cool “sight”…the freaking thing was huge and delicious! Now- Jeff Eats appreciates that my “eating” was done buffet style- with a load of friends-a load of noise-but trust me, the food was real solid…no ifs, ands or buts- I would definitely “patronize” Giant Pizza if the joint was in my-neighborhood! check out the menu on the web site – they have many , many choices and the prices – even for the 24″ and 30″ pizzas are pretty good. After your write up I checked out Giant Pizza and had its pizza. A real winner slice. Good pick.